To me accessorizing a room is the fun part…It is like your favorite dessert after a meal, and who doesn’t like dessert? I am a cupcake kind of a girl, so dessert is right up my alley! I don’t like to work in an office type atmosphere, when I have designed my last two office spaces they were decorated more like a home and looked like more like a home than an office. I just work better that way. 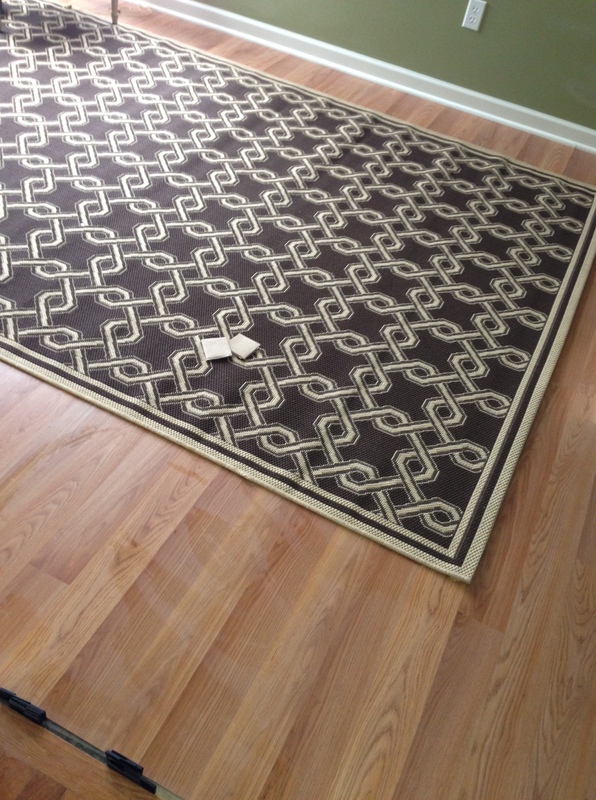 Since I brought the desks back with me, and they are two toned with a cream base and cherry top, I thought I would pick out a really bold rug to make the floors stand out – since this would be a high traffic area, I decided I wanted a dark brown color. I fell in love with this rug . But not the price,…so off to Google I went. 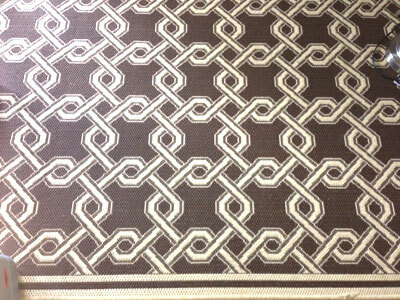 I found this rug at Home Decorators – the Martha Stewart Living, Crosslink All Weather Rug in Chocolate/cream, it was only $157 dollars, and I received it in 2 days…done! It is an indoor out door rug, but I have had great luck with them in my house as well as in my offices! I love the texture it brings to the room. When I first started having my own place, I thought everything you had to match, if the room had a silver frame, all frames had to be silver, lamps were all the same – you get the drill…Boy I was so wrong, when adding accessories to a room it is really important to build on the layers and textures in a room, so mix and match and find common themes. The focal point of this room is the sign over my desk. 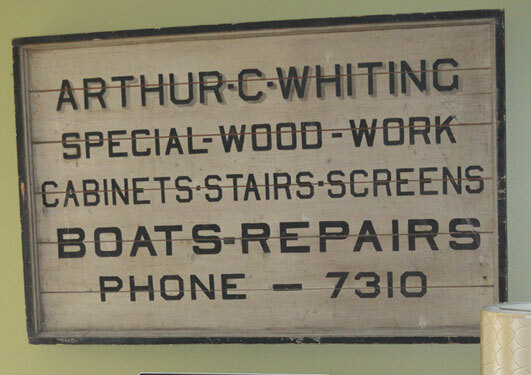 It is about 90 years old – it is in awesome shape, it was my Great Grandfather’s sign for his business….which my day job is named after. Since I really did not want to bring much art into the space – I am kind of tired of floral prints in every room – I leveraged these two bulletin boards covered in fabric and turned them vertical and, voila!, functional art, and they add great height and color to the room (am I had them so they were free)! To break up the look a little bit and to add more storage I added another shelf above the l-shape desk. 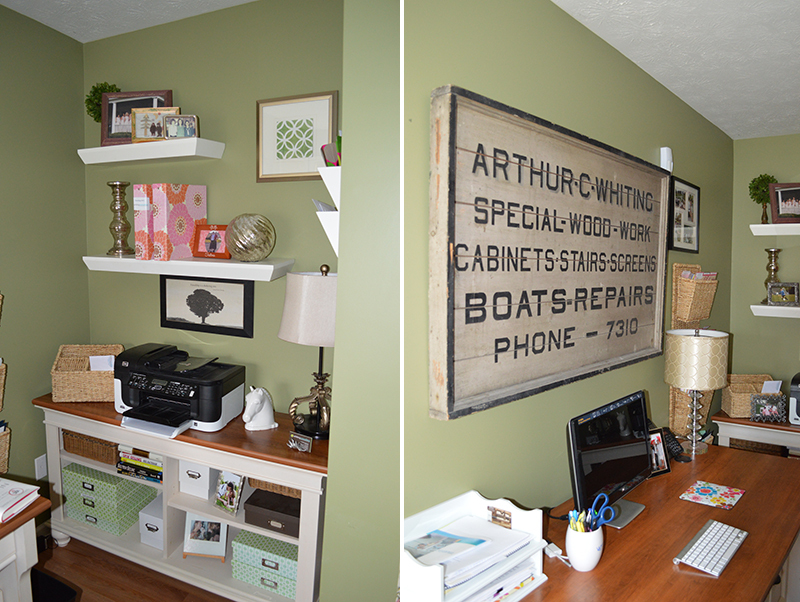 I did not want all the shelves to match – so I bought this shelf from Ballard Design, which I love! Finally in the corner is one of my favorite pieces that I own. You will see throughout my house, I love wingback chairs…I found this chair for 20 dollars and it was ugly but I loved the lines…. 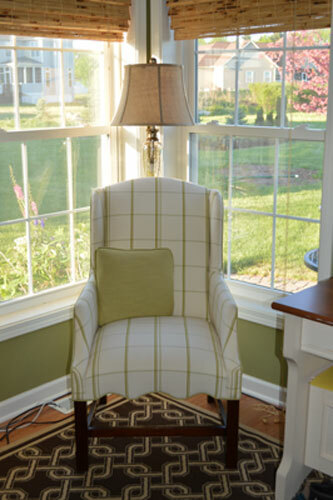 I had this check fabric since I bought my house, over 8 years ago, but never could find a place for it…I had this chair redone for my old office, the chair is two toned, check in the front and a linen fabric on the back!! It looks awesome! 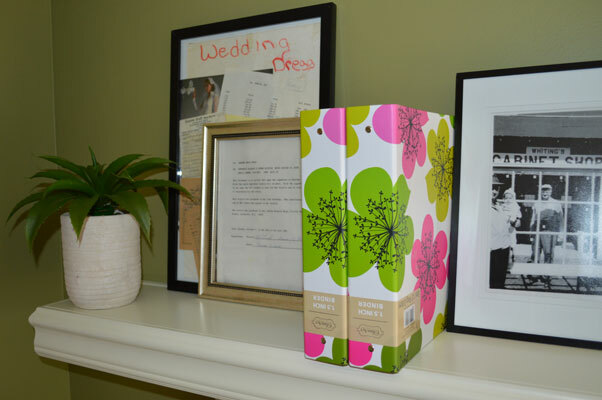 I layered the shelves with photo’s I had in my old office – I needed the shelves to be both function for storage but also to add some “me” to the room! My Mom put these shadow boxes together for me on Whiting Consulting’s 10th anniversary. These boxes remind my why I am in business today, always wanted to a business owner – here is a look of what I did when I was a kid! Finally here is a look at how my desk area turned out. I would have to say I don’t mind having my back to the door, I don’t get any glare on my computer screen which is a bonus and I have a great view of outside. All in all the home office has turned out pretty good. So when I decided to take my Recruiting Company virtual…I needed a place to work from home…the office was looking pretty shabby! My Hubby also works out of the home – so he very graciously moved to the basement so I could have the windows – isn’t he sweet? 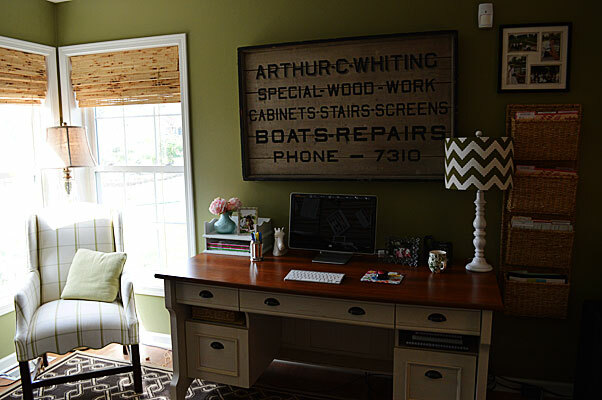 The thing is I did not decide to start a blog till after the office redo was in motion! But what I can tell you is the room looked like a dorm room – there was a lamp, a desk and a chair – that was it! 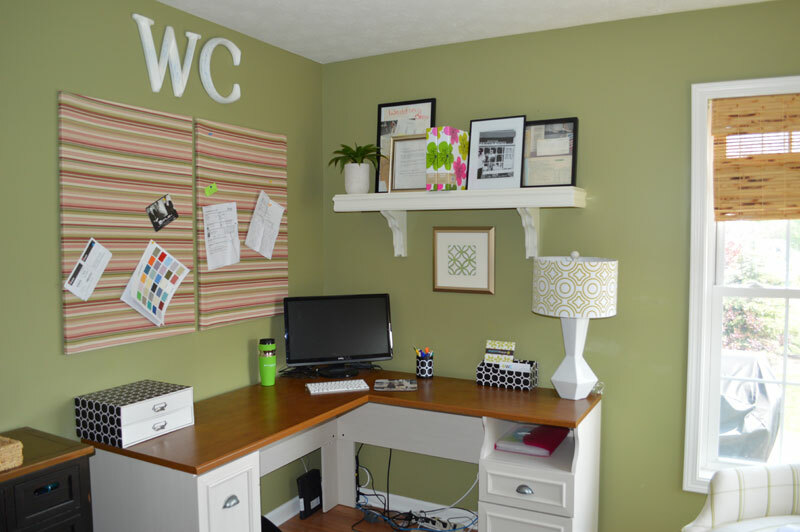 Goal of the room – Our home office is 130 square feet, I needed the space to support 2 office areas and to have as much storage as possible plus look pretty at the same time! Oh boy! The cool thing is I love the color…so we did not have to paint! The color is Laura Ashley’s Olive 4. It is a darker color – but don’t be afraid to paint a small space a dark color; it actually makes the room feel bigger! The carpet was looking pretty old, Linus our dog loves to come into the office while we work during the day – so you know dogs – so the carpet had to go! I was tired of carpet in this room anyway so I decided to go with a Pergo floor. We found the floor at Home Depot for 69 cents a square foot! Sold!! I picked a little lighter hue than the hardwoods in our house to give it a live transition. The hardest part of the room design was furniture placement. I have had my desk for 10 years and I am a little attached to it. 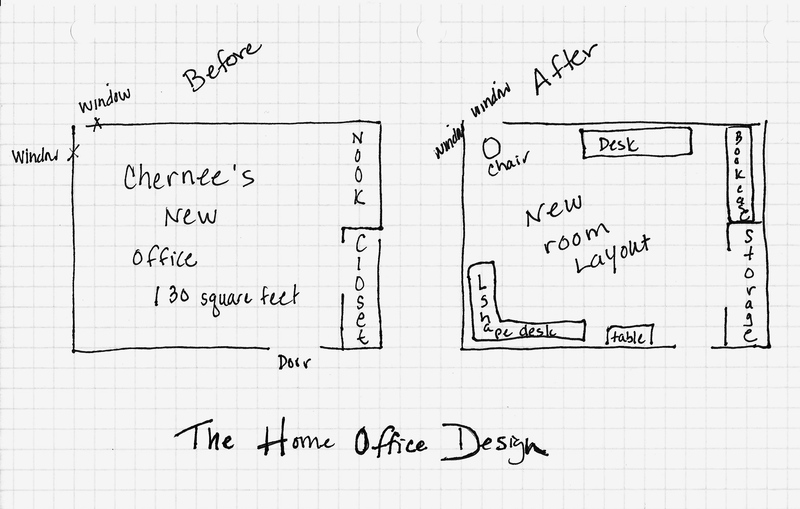 At first I was going to put two L- shape desks in the space, which probably would have been better, but you need to like where you work! 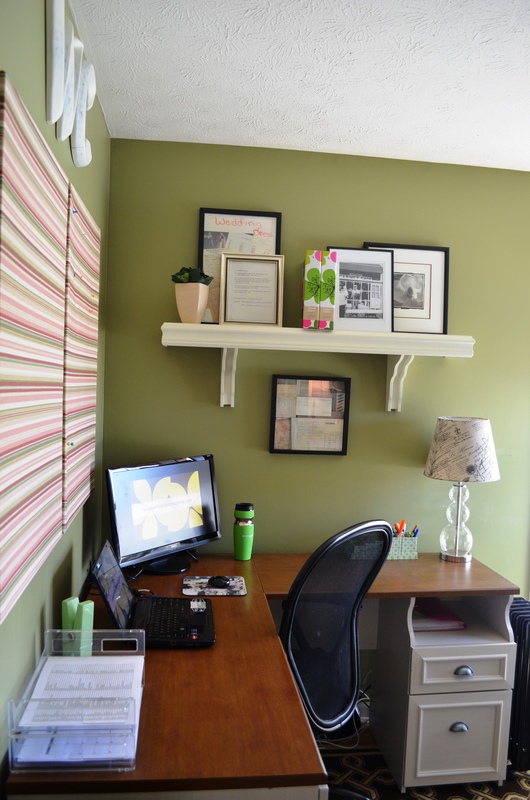 The office has two great windows so there is a lot of light and good wall space for this small of the room. I really did not want to have my back to the door from a feng shui perspective but the desk fit very nicely and I have a great view from the window. We have a nook in the room and I put a low shelf that fits perfectly in the space and now has a built-in effect. Then added floating shelves from Pottery Barn above it. I love bookcases but sometimes they cause a room to look overcrowded if they are too tall for the area. So when planning a bookshelf purchase consider height and how it will make the room feel. You want an airy effect. Finally the L-shape desk slid right into place on the opposite wall and the flow of the room was set up and the first goal was accomplished. The room now fits two folks and the space does not feel crowded. 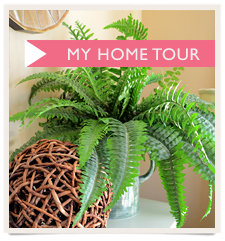 Next blog I will bring the room together with all the fun accessories and storage potential!